Comparisonitis is a Debilitating State. As you can see, that keeps me about as far removed from a ‘Party Animal’ as you can get. Sometimes it’s OK. It can be hard, though, when all those around you are letting their hair down, drinking champagne, and dancing till dawn while you’re staring glumly at your mineral water and slipping out of the door at 10.30pm. On my phone is a selfie and it’s not a pretty one. I took it during a vicious attack in November 2017. I had dared to drink one Jack Daniels and Sprite at a party the night before. One side of my face is swollen and so inflammed it looks like I might have had a stroke. You only need look at the image and you can see the excruciating pain I was in. It’s a good reminder to me when I feel tempted to throw caution to the wind and order a cocktail. Following on from the intense but enjoyable three week trip to Croatia with the Carado Vlow, I went straight out to the USA for 10 days to do some work for Airstream UK. I had put aside that week to catch up on admin, but production schedules in Ohio disallowed such a luxury. By the time I got back from America, loaded up my own Airstream, and hit the road, I was, as you can imagine, utterly exhausted. For the past two weeks I’ve been up and down with a Cluster Migraine; taking two steps forward then one step back. Despite living as cleanly as possible, I can’t do what a ‘normal’ person can do. The frustration is palpable and the ‘comparisonitis’ has been almost as debilitating as the migraine attacks. My current assignment has brought me to Balbirnine Park Caravan and Motorhome Club Site in the Kingdom of Fife in Scotland. It’s beautifully shaded and green thanks to the many trees in and around the site. There is 400 acres of parkland next door. Interviewing a regular visitor to the site, Derek, I found out a little bit about the layout of the park, and also about a specific bench. On my dog walk the next morning I went and found the bench. 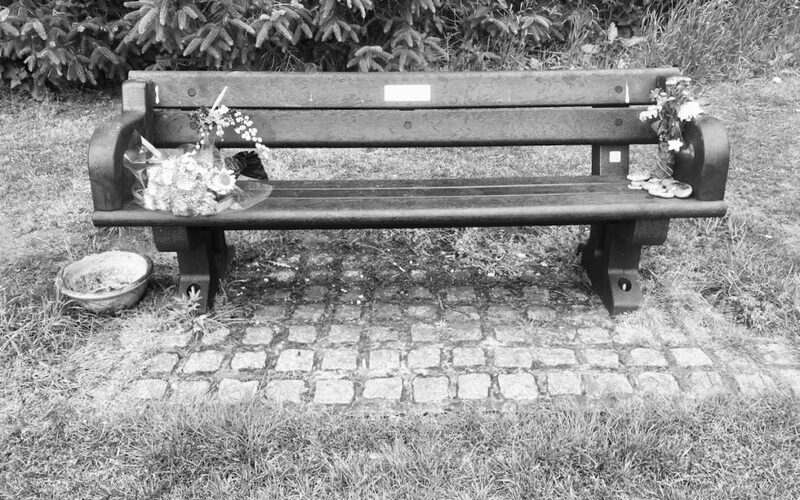 Flowers were still being left, together with painted stones. 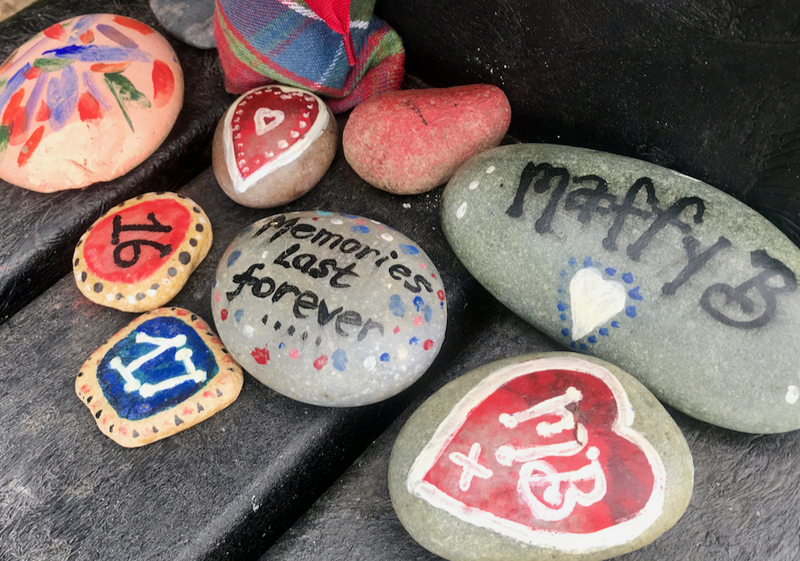 The stones that said ’16’ and ’17’ were especially poignant; obviously markers of the ages he would have acheived on birthdays he no longer saw. Naturally, I shed a few tears for ‘Matty’, his family, and his friends. I took a picture of his bench to keep in a file with the swollen migraine selfie on my phone, just in case I start feeling sorry for myself because I can’t stay up late or get tipsy on bubbles. I then continued with my joyous, full, and charmed life.